My absolute favorite place!! Beautiful shot!!! 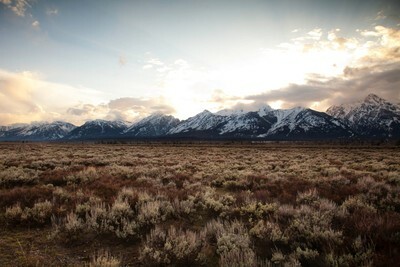 Beautiful and unusual shot of the Tetons. Congrats on being featured! I took this photo in Teton National Park. I was trying to find a vantage point away from the typical parking areas along this section of the park so it didn't match the typical tourist shot. This photo was taken just as the sun dropped below the horizon at sunset. I spend a lot of time rearranging my day to be in the elements during times of good light (i.e. early morning and sunsets). This was taken with a Canon EOS 5D Mark II and Canon L series 24-105mm f/4.0 Lens. This setting was begging for a photograph - as Teton National Park always does. I enjoyed the way the clouds were wispy at the top and the light was filtering through. And the sun behind the horizon line made for a very calm scene. The post processing is very minimal, mostly sharpening, contrast and saturation adjustments. I do carry a few other pieces of gear even though I shoot most of my photos with my 24-105mm Canon lens and body. I keep a Canon 70-200mm f/2.8 and 50mm portrait lenses in my bag. I also like to have graduated, color cast and polarizing filters on hand, just in case - though I did not use them for this photo. Many people mention how critical it is to be out in the scenes when the light is good - early morning and late evening and that is true. However, it is not the only time of the day it is acceptable to take a photograph. Sometimes making time to get out under partly cloudy or very cloudy conditions can yield interesting results. Long story short, never stop looking for that opportunity.